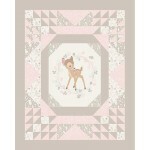 Bambi fabrics are for quilting, apparel, craft and decorating projects and are licensed by Disney. Bambi and Friends Patch Cotton Fabric..
Disney Bambi and Thumper Badges Cotton Fabric. Fabrics for quilting and sewing craft projects..
Disney Bambi Badge Green Cotton Fabric. Fabrics for quilting and sewing craft projects..
Disney Bambi Leaves Toss Cotton Fabric. Fabrics for quilting and sewing craft projects..
Disney Bambi Silhouette Blue Cotton Fabric. Fabrics for quilting and sewing craft projects..
Disney Bambi Toile White Cotton Fabric. Fabrics for quilting and sewing craft projects..
Disney Bambi Wreath Framed Cotton Fabric. Fabrics for quilting and sewing craft projects..